Training mats have been around for years now. Ever since people have being engaging in physical activities they have required exercise mats to protect themselves from injury. The kind of mats used have changed consistently over the year from the straw mats used by the Japanese starting centuries ago to the fabric filled mats in western organisation. 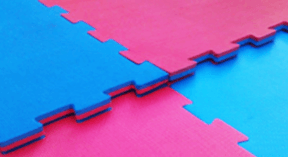 Today the most popular type mats are puzzle mats. Although puzzle mats have been around for a couple of decades now has not been a new mat to come along to replace them in popularity yet. Puzzle mats have withstood the test of time primarily because they are so practical and inexpensive. They are light weight which also makes them a great choice when decking out a training area. They are especially great if the mats need to be transported to different training area for use in a variety of venues. The ease of assemble is one of the qualities most commonly mentioned by people who rely on them. To be sure there are other training mat options available out there. Some may also be better suitable in some circumstances. But one think that is for sure is that puzzle mats are the most popular mat available out there. This is likely to remain the situation unless some new technology becomes available. Puzzle mats are readily available and can be easily shipped to any location.